Budds Creek hosted round four of the AMA Motocross Championship. Suzuki’s Ryan Dungey, a 450 Class rookie at the time, went 3-1 to capture his third straight overall. Honda’s Andrew Short went 1-5 for second, with Chad Reed (4-2) in third. Monster Energy/Pro Circuit Kawasaki riders took three of the top four spots in the 250 Class, with Dean Wilson winning over GEICO Honda’s Justin Barcia and teammates Tyla Rattray and Christophe Pourcel. It was an emotional win for Wilson because it was his first as a professional, and it came two weeks after he gave away the overall win at Freestone in Texas when he slowed way, way down on the last lap with an enormous lead, allowing his Monster Energy/Kawasaki teammate Tyla Rattray and Star Racing Yamaha's Broc Tickle to pass him before he realized that they were not lappers! See below—it's painful to watch! Ricky Carmichael went 1-1 at the Budds Creek National to capture his seventh moto in the first eight rounds to begin the 2005 AMA Motocross Championship. Chad Reed went 3-2 for second overall, with James Stewart third with a 2-3. The 125 Class was won by Mike Brown with a 1-3 over Ivan Tedesco (2-2) and Josh Grant (4-1). 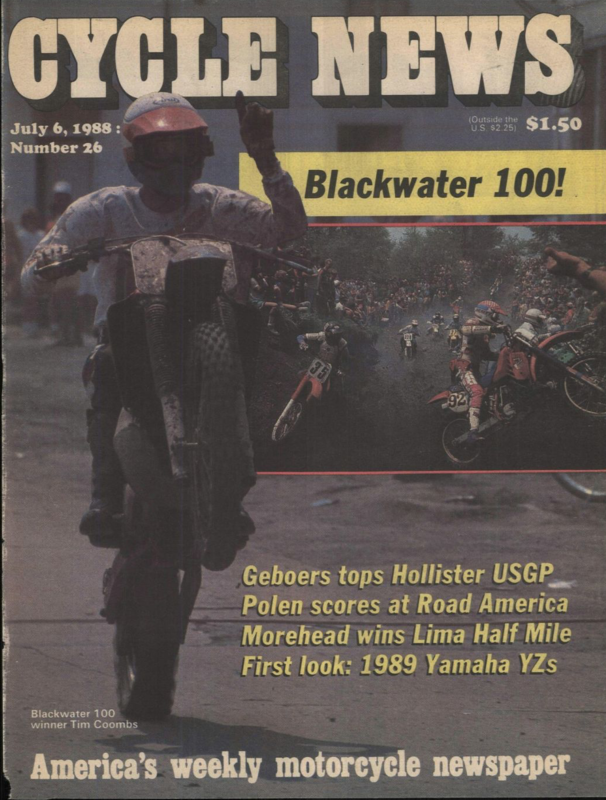 In one of the bigger upsets in the history of the Grand National Cross Country Series, professional motocrosser Tim Coombs led the 1988 Blackwater 100 from start to finish on a Honda CR500, despite scorching heat and a flat front tire late in the race. Coombs (DC's big brother) had some woods racing experience, but not to the caliber of some of his competitors, which included four-time Blackwater 100 winner Mark Hyde and future AMA Motorcycle Hall of Famers Eddie Lojak, Scott Summers, and Larry Roeseler. Tim earned himself the cover of Cycle News and seemingly eternal bragging rights as "1988 Blackwater 100 Champion." Lake Whitney Cycle Ranch in Lake Whitney, Texas, hosted round seven of the 1983 AMA Motocross Championship. Three classes—500, 250, 125—were raced that day, and it was Broc Glover taking the 500 win with a 1-1 performance. Danny Chandler and Kent Howerton rounded out the podium. The 250 Class went to Georgia native Billy Liles on his Kawasaki. Scott Burnworth and Donnie Cantaloupi took second and third. Finally, the 125 Class win went to Ron Lechien on his Yamaha. Jeff Ward and Mark Barnett finished second and third. Roger DeCoster once again got top billing for the U.S. FIM 500cc Grand Prix at Carlsbad Raceway, but once again, the most famous motocross rider on the planet had his difficulties, DNFing the second moto after finishing second the first time out. 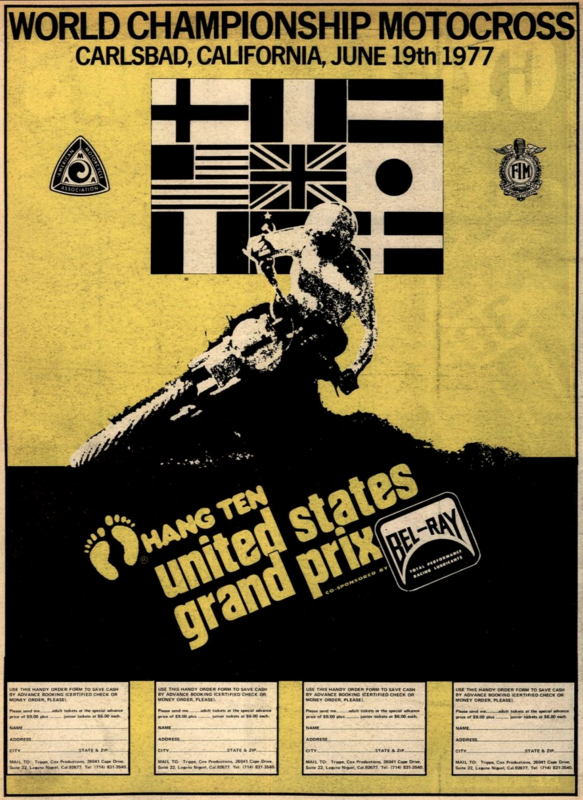 The race had a historic note for Americans, as Team Honda's Jim Pomeroy became the first U.S. rider to win a moto at what was the biggest race on the calendar at the time. Pomeroy won the first moto, but, like DeCoster, did not finish the second time out. The beneficiary was Yamaha rider Heikki Mikkola of Finland, the '76 FIM 250cc Motocross World Champion with Husqvarna, who would soon unseat The Man as 500cc World Champion for a second time in four years.